Themes: Fantasy; adventure; friendship; reconciliation; fairy-tale. Synopsis: When 13 year old Maria Merryweather is orphaned, she leaves her life in London to go and live with her cousin, Sir Benjamin Merryweather, in the village of Silverydew in Moonacre Valley. Arriving there, Maria soon realises her cousin’s home is full of magic and wonder. However, beneath the surface of happiness and content, Silverydew is suffering at the evil hands of the Men from the Dark Woods. These hostile relations began many generations ago but Maria soon learns that she has a vital role to play in bringing reconciliation. My thoughts: I first read this book when I was about nine years old and loved it. Reading it again 20 years later I loved it just as much, if not more. For me it had all the ingredients of a perfect children’s story: unusual, original characters; risk and adventure; friendship; animals that seem almost human; and satisfying triumph over adversity. The story is told from the viewpoint of Maria and as the reader I felt every part of her journey as though I was living it myself. Coming from an urban London home, Maria’s new life is brimming with new mysteries and enchantment. From Scarlet Marmaduke, the dwarf-like chef; to Wrolf the fiercely loyal dog as large as a lion; and to wondering who lays out Maria’s clothes each morning and lights the fire without her waking – life in Silverydew is full of magical intrigue. 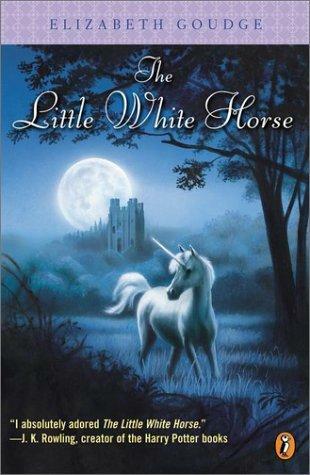 As I was reading The Little White Horse I often felt like I was reading a fairy tale, rich and timeless. The characters, both animal and human, all seem to have a magical quality to them. The clear distinction between the good characters and the wicked ones reminded me of Grimm’s tales. However, the good characters are not boring and predictable. Whilst they have strong virtues, they also battle with their weaknesses. Maria learns to overcome her impatience and learn not to quarrel whilst Sir Benjamin learns the importance of forgiveness and humility. The animals too have a fairy tale quality to them. Whilst they are not talking animals, they seem to understand and relate to Maria with the wisdom and nobleness that only animals have. Wrolf the dog and Periwinkle her horse, are always there to show Maria the way and rescue her from danger. Towards the end of the book, there is a hint that Wrolf is actually a lion and not a dog at all. I immediately thought of Aslan from the Narnia books, but interestingly, Elizabeth Goudge wrote this book before Narnia had been written. Perhaps C.S.Lewis found some inspiration in The Little White Horse. As well as the characters, I thought the plot too was reminiscent of a timeless fairy tale. Once Maria, becomes settled in her new home, the main adventure begins. The benevolent Old Parson tells Maria the history behind the Men from the Dark Woods and their animosity towards the people of Silverydew. It is the ancient vices of greed and pride that are at the root of the enmity. And as with all fairly tales, the evil must be overcome with good so that reconciliation can be made, thus bringing the ‘happily ever after’ ending. The Little White Horse was first published in 1946 and provides a clear example of how children’s literature has changed over the last 60 years. Whilst I read modern children’s books in a few days, it took me significantly longer to finish The Little White Horse. It wasn’t that the story lost my attention and nor was the language old-fashioned or heavy-going. There just seemed to be more to take in. It was like a delicious gourmet meal that I wanted to savour, rather than a fast-food binge that brings instant gratification but lacks any sustenance. Unlike many modern children’s books which jump into the action on page one, The Little White Horse has a more gradual build up to the climax. Contemporary books are often action-packed on every page and the high-adrenaline pace is maintained throughout. However, reading The Little White Horse, I really noticed and appreciated the more varied pace which built up to the climax. The story seemed perfectly shaped and proportioned. Of course Elizabeth Goudge wasn’t having to compete with video games and DVDs to secure her audience. In our highly stimulated, technology-centred world, I can see why so many children’s books read like a whirlwind, action-packed thriller. However, at the same time I think books shouldn’t have to compete at the same game. Books don’t have to imitate their rivals. Reading a story like The Little White Horse is a very different experience to watching a DVD or playing a video game. It is richer, more rewarding, more magical and ultimately has a more lasting impact. I would highly recommended The Little White Horse to readers age nine years and older and perhaps more to girls rather than boys. Posted in 9+, Adventure, Classical Literature, Fairy tale, Friendship, Magic, Reconciliation, Triumph Over Adversity. Bookmark the permalink. I am a big fan of children's literature - both reading children's books and also writing my own stories for children. I am currently working on my first children's book, The Springs of Inyani. I am a qualified primary school teacher and have taught at primary schools in London and Hampshire. I am the creator of Creative Beans - creative writing workshops for children. Running these workshops gives me much enjoyment and I always look forward to reading the fantastic stories written by young authors. (www.creativebeans.org) Over the last few years, I have jotted down my thoughts and a short summary of any children's books I read. Given that children and parents often ask me for book recommendations, it made sense to put my thoughts and summaries online. All the reviews listed are my own personal opinion. This is purely subjective so please read with as many pinches of salt as you think necessary. Creative Beans Creative writing workshops for children.